This is my current video setup. 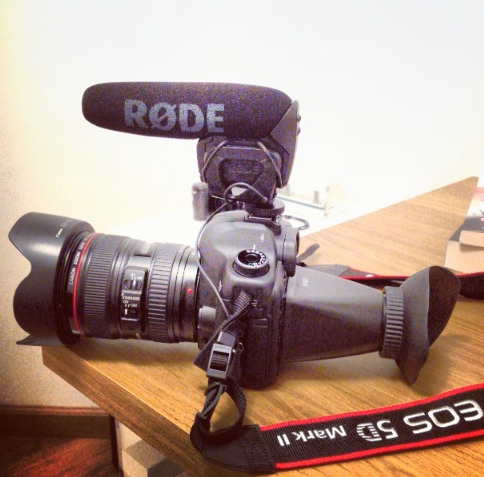 Canon 5D Mark II with a Röde Videomic Pro. Canon 24-105mm lens with a hood and my latest thing for this rig that helps out a lot is the LCD-V1 viewfinder that arrived a few days ago. For the days when the sun is nice and bright I have a Phottix variable ND-filter. I hope to capture and upload some nice videos soon. First up is a small tour of our new house that I’ll send to my grandparents that don’t have the opportunity to visit in a near future as we live in different countries. I don’t think I’ll post that here anyways but that’s still the first thing I have planed. Hopefully I’ll be done with that one this weekend. This entry was posted in Video and tagged 5dmkii, canon, Canon 24-105mm, canon 5d mark ii, dslr video, röde, video, video rig, video setup, videography, videomic pro by André - LighterPacks.com. Bookmark the permalink.